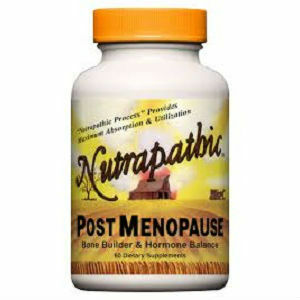 Nutrapathic Post-Menopause is a hormone balance and bone supplement that offers a complete variety of the nutrients that are important for post menopause women. After menopause, a woman’s body is far less able to break down and absorb calcium. Therefore, taking a mega dose of calcium will not be enough. In fact, this can even result in excess calcium being stored and building up in the kidneys, in the gallbladder, or on blood vessel walls resulting in kidney stones, gall stones, and clogged arteries. Our hormone balance and bone supplements contain special ingredients that will provide necessary calcium while also helping the body to absorb and utilize calcium. These hormone balance and bone supplements will provide the necessary nutrients that your body needs to bring it into harmony and balance. This will allow you to absorb the calcium needed for strong teeth and bones. EACH TABLET CONTAINS: Calcium (from egg shell) 50 mg, Magnesium (as amino acid carbonate, oxide) 100 mg, Collagen (chicken) 45 mg, Lact-Amino Type C 38 mg, Soy Protein digest 38 mg, Wild Yam Extract (6% saponins) 50 mg.
Each tablet also contains a 33 mg PROPRIETARY BLEND OF: Mucin, Safflower Oil, Horsetail (herb), Glutamic Acid HCL, Pituitary (porcine), Thymus (porcine). No information is available in the product source about daily dosage. No information was available in the product source about product guarantees or warranties. A contact number was provided however the vendor source did contain a notice that the vendor was going out of business and that his particular product was on back order. Because the vendor’s website indicated that this particular product was on back order and not currently available and that the vendor was conducting a going out of business sale at the present time, a prospective purchaser should look to purchase another product. Jackie Horowitz	reviewed Nutrapathic Post-Menopause	on February 10th	 and gave it a rating of 2.